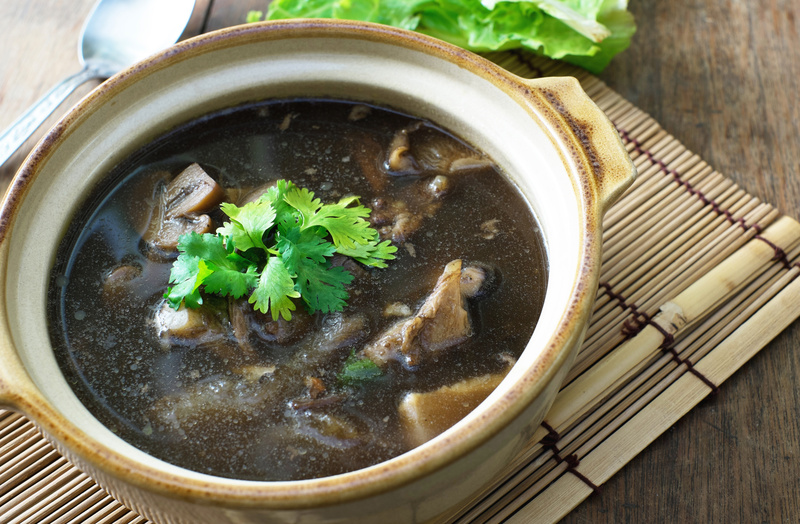 Today we are going to talk about bone broth, which has been very popular for the last few years, and also happened to be a big topic of my Chinese medicine thesis dissertation (with supporting information about acupuncture and herbal medicine). For thousands of years, broth has been used to maximize the extraction of nutrients out of available food sources. At some point in history, our human ancestors realized they could cook food in heated rock pits to make soup. While this is a simple concept for us today, it was a huge jump in consciousness back in early human civilization, and also a leap of genius. With soup, you can cook your food, but also conserve all of your food substances in an environment where food sources are scarce. By processing the food to make it absorbable, you increase your efficiency of feeding people many times over. We live in the 21st century, yet I do not know anyone who could not benefit from a nutrient-dense broth like our ancestors did. As we try to stay healthy with the influx of toxic substances, high stress, and the presence of cell phone and wifi frequencies, we can benefit from simple foods that deeply nourish us – and it doesn’t hurt that broths are economical. Bone broth is full of collagen, and oftentimes the formed constituents of blood, depending on which kind of bones you use. The constituents of bone broth are good for repairing tissues in the body, including skin, fascia, and digestive endothelium (the inner lining of your digestive tract). It is also good for hair and nails, and contributing to the fluid elements of the blood. It is a good supplement for people who are deficient and need to build up and repair their body in an overall gesture. Rather than just using water, or a sodium-overloaded/canned broth from the store, consider preparing some bone broth to freeze for later use when you want to make a nutritious drink or soup. It is important to opt for grass fed animals, because when animals are fed grains and other foods they did not evolve to eat, it inflames their digestive system and decreases their quality of life. Supporting pasture-raised farms supports a better quality of life for the animals, and it helps us stay healthy with better quality meat and bones. The least we can do for an animal that is giving its life for us is to make sure it was treated humanely. I do not suggest for people to make bone broth out of non-organic, non-pasture-raised or non-grass fed bones where they are not familiar with the bone source. We purchase our bones from Whole Foods in Cary, because they are the only local grocer selling bones that gives us some idea of how the animal was raised. Whole Foods uses the rating system set forth by the Global Animal Partnership, which gives detailed ratings to the ranching and farming practices of companies who apply. Here are their standards as of July 13, 2016. Some broth-makers will brown the meat and bones in the oven before adding them to the water to caramelize the sugars and make the subsequent broth more flavorful. This step is not necessary, but can make the broth more palatable. Start with a big pot of bones and cover them with filtered water and a splash of apple cider vinegar. Simmer the broth on low for 6-8 hours, skimming any froth off the top to discard. When done, remove the bones from the pot and put the pot of broth in the fridge overnight so the fat condenses at the top for removal. You can use this fat to make tallow (see below). After removing the initial batch of bones, cook the same used bones another 6 hours in another pot filled with filtered water to cover the bones, again with a splash of vinegar. The second extraction will yield more gelatin. Plan ahead with glass tupperware and freeze your broth for later use. Chicken bones produce a more flavorful broth than beef, but in Chinese dietetics, lamb bones are said to fortify the kidney. Knuckles, pig feet, chicken feet, and joints have a high collagen content. Bones like a femur will have more marrow. If you need more collagen i.e. your joints ache or your skin is dry, consider using bones with higher collagen content. If you are blood deficient, consider using more beef and marrow bones. You can make a nutritious, fresh, high heat oil from the fat that solidifies on the top of your broth overnight in the fridge. Called tallow, this fat contains many vitamins and minerals not present in store-bought fats. Heat the fat in a pot on very low. Make sure not to burn yourself! Line a ceramic funnel (like a coffee beehive or drip funnel) with 1-2 coffee filters, and then secure the funnel over a mason far and pour the warm fat into the funnel to slowly filter into the mason jar. Again, don’t burn yourself. You can use tallow for frying or cooking with woks etc. Is does have cholesterol in it, so if you are trying to avoid cholesterol, it might not be a good fat for you. Talk to your acupuncturist, naturopath, or primary care provider about whether or not bone broth is appropriate for you. If you have joint pain or digestive discomfort, an acupuncturist can help you utilize food as medicine, along with acupuncture and herbal medicine, to help you heal your body, decrease pain, and promote optimal physiology. Kristin ten Broeck, MSOM, L.Ac.